Each piece is individaully made of 1 separate piece of wood. Each individual piece can be picked up to look at it. The leaf is fully finished and is 3 Dimensional. See the pictures below. This piece may used as a sculpture by itself or used as a deskset in front of the person's name. Custom Designed Font is used for each person's name. A deskset of pens and pencils maybe added if desired. We recommed this be kept in a glass display box for viewing, because all the pieces can be individually picked up to see the full dimensions. Each piece is quite are fragile. 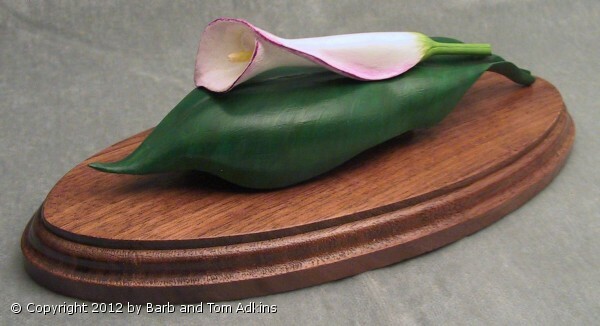 Size: Calla Lilli-1 1/2" x 5 1/2", Leaf-1" x 8" , Base- 4 1/4 x10"